Halloween can be a funny holiday. I have never enjoyed the creepy, gross-you-out, super scary things that some people like to do for Halloween. But I do love pumpkins, leaves and costumes (non-scary ones of course). As mom to a little guy, though, Halloween brings a whole new dynamic....what to do with all that candy?! Last year, we didn't go trick or treating. I made K a Yoda costume, Joe was a Jedi and I was Princess Leia. 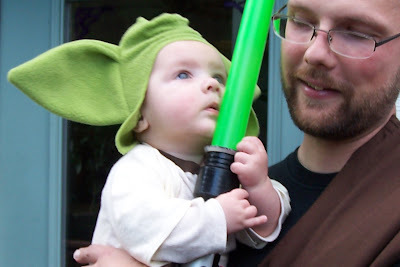 We went to a Halloween party and K was so little we just wore him around in the sling all night. We had a blast but because we didn't go trick or treating, there was no need to worry about piles of candy when we got home. This year was a little different because K can walk and could actually go trick-or-treating. K's friend Evie came over and we took them out trick-or-treating. Evie was a cheerleader and K was a monk (You can even check out my monk costume tutorial), although he was also frequently mistaken for being a Jedi. We just went around our block but still came home with a nice little bag of candy. So now, what to do? We have a bag of candy and we don't really eat candy. K, especially, doesn't eat candy. I got a lot of "let him have one piece a day" advice (and a lot of looks from people who thought I was nuts for wanting to avoid giving my 1 year old candy), but I just didn't feel comfortable going from one piece of candy or a bite of a cookie about once every 10 days or so to once a day. Why? Primarily because most candy has high fructose corn syrup as a main ingredient - which is made almost exclusively from genetically modified corn. Most candies also include artificial food dyes, which studies are starting to show can cause behavior problems in some children, especially those with an intolerance to food dye, like my nephew. So, uh, no thanks. I read about the Candy Fairy online and thought it was such a genius idea that we decided to adopt it. The Candy Fairy, you see, is a cousin of the tooth fairy. 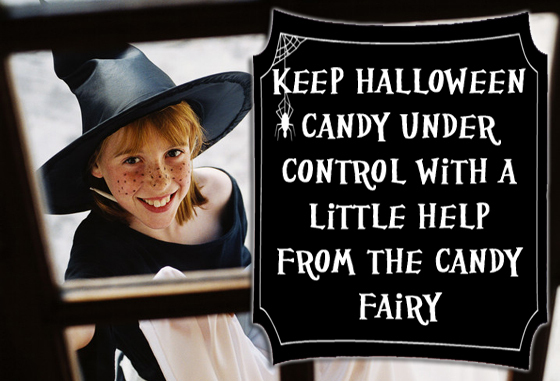 Her job is to help her cousin's mission of pristine teeth by removing excess candy from homes post-Halloween. Once you are done trick-or-treating, you can pick out one thing from your bucket for every year old you are. Everything else gets left for the candy fairy. She comes overnight and takes the candy away and leaves a cool toy in it's place! What do you do with all your Halloween candy? Does the Candy Fairy visit your house? Do you bake it into cupcakes? Do you give it away? I'd love to hear about it! We "bought" Ainsley's candy from her for a quarter a piece. She was allowed to use that money today when we went to our local natural toy store. She loved being able to pick out something. I think the fairy thing is a cute idea. Peppermint Pretzel Rods - Nailed It! Join me at the CSI Project!